BEIRUT (AP) — The U.S. government insists it has the intelligence to prove it, but the American public has yet to see a single piece of concrete evidence — no satellite imagery, no transcripts of Syrian military communications — connecting the government of President Bashar Assad to the alleged chemical weapons attack last month that killed hundreds of people. In the absence of such evidence, Damascus and its ally Russia have aggressively pushed another scenario: that rebels carried out the Aug. 21 chemical attack. Neither has produced evidence for that case, either. That's left more questions than answers as the U.S. threatens a possible military strike. The early morning assault in a rebel-held Damascus suburb known as Ghouta was said to be the deadliest chemical weapons attack in Syria's 2½-year civil war. Survivors' accounts, photographs of many of the dead wrapped peacefully in white sheets and dozens of videos showing victims in spasms and gasping for breath shocked the world and moved President Barack Obama to call for action because the use of chemical weapons crossed the red line he had drawn a year earlier. Yet one week after Secretary of State John Kerry outlined the case against Assad, Americans — at least those without access to classified reports — haven't seen a shred of his proof. There is open-source evidence that provides clues about the attack, including videos of the rockets that analysts believe were likely used. U.S. officials on Saturday released a compilation of videos showing victims, including children, exhibiting what appear to be symptoms of nerve gas poisoning. Some experts think the size of the strike, and the amount of toxic chemicals that appear to have been delivered, make it doubtful that the rebels could have carried it out. What's missing from the public record is direct proof, rather than circumstantial evidence, tying this to the regime. The Obama administration, searching for support from a divided Congress and skeptical world leaders, says its own assessment is based mainly on satellite and signal intelligence, including indications in the three days prior to the attack that the regime was preparing to use poisonous gas. But multiple requests to view that satellite imagery have been denied, though the administration produced copious amounts of satellite imagery earlier in the war to show the results of the Syrian regime's military onslaught. When asked Friday whether such imagery would be made available showing the Aug. 21 incident, a spokesman referred The Associated Press to a map produced by the White House last week that shows what officials say are the unconfirmed areas that were attacked. The Obama administration maintains it intercepted communications from a senior Syrian official on the use of chemical weapons, but requests to see that transcript have been denied. So has a request by the AP to see a transcript of communications allegedly ordering Syrian military personnel to prepare for a chemical weapons attack by readying gas masks. The U.S. administration says its evidence is classified and is only sharing details in closed-door briefings with members of Congress and key allies. The assessment, also based on accounts by Syrian activists and hundreds of YouTube videos of the attack's aftermath, has confounded many experts who cannot fathom what might have motivated Assad to unleash weapons of mass destruction on his own people — especially while U.N. experts were nearby and at a time when his troops had the upper hand on the ground. Rebels who accuse Assad of the attack have suggested he had learned of fighters' plans to advance on Damascus, his seat of power, and ordered the gassing to prevent that. "We can't get our heads around this — why would any commander agree to rocketing a suburb of Damascus with chemical weapons for only a very short-term tactical gain for what is a long-term disaster," said Charles Heyman, a former British military officer who edits The Armed Forces of the U.K., an authoritative bi-annual review of British forces. Inconsistencies over the death toll and other details related to the attack also have fueled doubts among skeptics. The Obama administration says 1,429 people died in 12 locations mostly east of the capital, an estimate close to the one put out by the Western-backed Syrian National Coalition. When asked for victims' names, however, the group provided a list of 395. On that list, some of the victims were identified by a first name only or said to be members of a certain family. There was no explanation for the hundreds of missing names. In Ghouta, Majed Abu Ali, a spokesman for 17 clinics and field hospitals near Damascus, produced the same list, saying the hospitals were unable to identify all the dead. Casualty estimates by other groups are far lower: The Britain-based Syrian Observatory for Human Rights says it only counts victims identified by name, and that its current total stands at 502. It has questioned the U.S. number and urged the Obama administration to release the information its figure is based on. The AP also has repeatedly asked for clarification on those numbers. The humanitarian group Doctors Without Borders says it has not been able to update its initial Aug. 24 estimate of 355 killed because communication with those on the ground around Damascus is difficult. That estimate was based on reports from three hospitals in the area supported by the group. Moreover, the group, whose initial report was cited in U.S. and British intelligence assessments, has rejected the use of it "as a justification for military action," adding in a disclaimer published on its website that the group does not have the capacity to identify the cause of the neurotoxic symptoms of patients nor the ability to determine responsibility for the attack. French and Israeli intelligence assessments back the U.S., as does reportedly Germany's spy agency, on its conclusion the Syrian regime was responsible. However, none have backed those claims with publicly presented evidence. Some have suggested the possibility, at least in theory, that the attack may have been ordered by a "rogue commander" in Assad's military or fighters seeking to frame the regime. Testifying Wednesday before the House Foreign Affairs Committee, Defense Secretary Chuck Hagel rebuffed a congressman's bid to declassify one of the key pieces of intelligence Kerry publicly cited last week: intercepted communications telling Syrian military units to prepare for the chemical strikes. Still, there was very little pushback from members of Congress on the government's conclusion that the Syrian regime was responsible. Sen. Dianne Feinstein, D-Calif., said the intelligence was "very compelling" and that senators have had more access to classified information on Syria than they've had on anything in her two decades in the Senate. Asked if that was enough to merit a U.S. military reaction, she said: "Yes, it's enough for me. I think the prohibition on chemical weapons is well-founded." Hisham Jaber, a retired Lebanese army general who closely follows Syria's war, said it would be "political suicide" for the regime to commit such an act given Obama's warning. He also questioned U.S. assertions that the Syrian rebel fighters could not have launched sophisticated chemical weapons. He said that some among the estimated 70,000 defectors from the Syrian military, many of them now fighting for the opposition, could have been trained to use them. "It is conceivable that one or more know how to fit a rocket or artillery shell with a chemical agent," said Jaber, who also heads the Beirut-based Middle East Center for Studies and Political Research. He claimed Syrian insurgents have acquired chemical weapons, bought from tribes in Libya after the fall of dictator Moammar Gadhafi, through Saudi interlocutors. Other weapons from Libya have been used in the conflict, though Jaber did not offer evidence to support his chemical weapon claim. Saudi Arabia has been a chief supporter of the opposition. Prince Bandar bin Sultan, head of Saudi intelligence, recently flew to Moscow, reportedly on a mission to get Russia to drop its support for Assad. Syrian government officials and Assad accused foreign fighters of carrying out the attacks with the help of countries like Saudi Arabia and Turkey in the hopes of prompting an international military intervention. Syria says some of its own soldiers were badly contaminated in Jobar, on the edge of Damascus, as they went into tunnels cleared by the rebels. U.N. experts, who had been collecting tissue and other samples from victims in Ghouta, also visited the Mazzeh military hospital in Damascus, taking samples from injured soldier there. Two days after the Ghouta attack, state television broadcast images of plastic jugs, gas masks, medicine vials, explosives and other items that it said were seized from rebel hideouts. One barrel had "made in Saudi Arabia" stamped on it. In the U.S., the case for military action has evoked comparisons to false data used by the Bush administration about weapons of mass destruction to justify the 2003 invasion of Iraq. Multiple U.S. officials have told AP that the intelligence pictures on the Aug. 21 attack was "not a slam dunk" — a reference to then-CIA Director George Tenet's insistence in 2002 that U.S. intelligence showed Iraq had weapons of mass destruction — intelligence that turned out to be wrong. They cite the lack of a direct link between Assad and the chemical assault — a question the administration discounts by arguing Assad's responsibility as Syria's commander in chief. 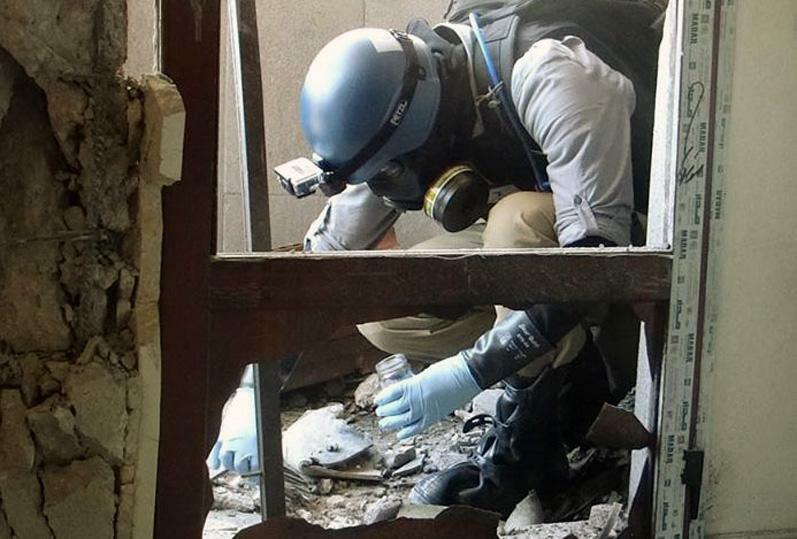 A second issue is that U.S. intelligence has lost track of some chemical weaponry, leaving a slim possibility that rebels acquired some of the deadly substances. Russian President Vladimir Putin — a staunch ally of Assad — said if there is evidence that chemical weapons have been used, specifically by the regular army, it should be submitted to the U.N. Security Council. "And it ought to be convincing. It shouldn't be based on some rumors and information obtained by intelligence agencies through some kind of eavesdropping, some conversations and things like that," he told The Associated Press in an interview late Tuesday. David M. Crane, an international law professor at Syracuse University in New York, said the scale of the attack makes it very unlikely that anyone other than the regime was behind it. "I think it was a calculated risk by the Assad regime to push to see how far he can go while causing a great deal of political disruption," he said. "It's a huge gamble, but he's in a very risky situation." AP Intelligence Writer Kimberly Dozier reported from Washington. Associated Press writers Greg Katz in London and Richard Lardner and Bradley Klapper in Washington contributed to this report.